Both teams are unbeaten. The Texans are ranked 6th in the national polls while the Mavericks are D2’s top rated team. Tarleton is experiencing its first winning campaign for the players on the current roster. TSU went 6-6 a year ago but returned a lot of players. MSU also brings back much of the 2017 squad that went unbeaten in the regular season before losing in this round of the playoffs to eventual champion Texas A/M Commerce. The Texans are a run-first team that might as good on the ground as any team in the country. TSU has a pair of backs that’ve gone over the 1,000 yard mark for the season despite the offense being a single back set. Xavier Turner (#21) is a sturdy runner who bounces off defenders and finds space quickly. Turner was the Lone Star Conference (LSC) Offensive Player of the Year, scoring 22 touchdowns on his way to 1,391 yards. When the Texans look for more of a homerun threat they turn to Daniel McCants (#6), who averages 7.4 yards per tote. McCants has 1,124 yards from scrimmage and 8 scores. A week ago Commerce held Turner under 100 yards, but McCants broke loose for big gains and finished the day with 181 yards and two touchdowns. TSU isn’t merely a running team; it supplements the ground attack with a quarterback who is a dual threat and executes a quick passing game. The Texans want to run hurry-up and will often lineup immediately after the previous play is blown dead. Signal-caller Ben Holmes (#2) is an experienced leader. Holmes has run for over 500 yards and 7 scores and thrown for 2,461 yards and 27 touchdown passes with 6 interceptions. The Texans will throw quick hitch passes along with 50/50 balls to their tall wideouts. While TSU has receivers who can make plays in space and turn short gains into long touchdowns. Holmes main target is Zimari Manning (#4). Manning is 6’2 and can go up and get a ball but is also dangerous after the catch, averaging 20 yards per catch. Manning has reached the end zone 11 times on 39 grabs. The TSU defense likes to play a 4-man front. It has good size on the interior and is stout against the run. A week ago the Texans held Commerce to -2 yards rushing, largely in part to 7 sacks totaling 44 yards. The Texans allow merely 80 yards per game on the ground. This will attack the heart of Mankato’s offensive identity. Tarleton has a slew of players with a handful of sacks and this bunch isn’t afraid to hit. TSU plays very aggressively, racking up an average of 88 yards in penalties per contest. That’s the 12th most out of 168 D2 schools. If there’s any weakness to this TSU squad it appears to be in the secondary. Teams like Commerce gained chunk yardage and scores against them. The Mavericks continue to use their two quarterback system and while both had success this fall, Ryan Schlichte (#5) and JD Ekowa (#7) each struggled a week ago. They completed a combined 12 of 32 throws with 2 scores and 3 picks. I’ve spoken about this on a few occasions, but the Mavs need to get more efficient quarterback play if they are going to continue to advance in the playoffs. Both can make plays with their feet, with Ekowa being the more athletic of the two and Schlichte a slightly more precise passer. A week ago the Mavs tried to continually go to their horse, receiver Shane Zylstra (#84). Zylstra is 6’5 and his athletic frame provided a mismatch against CSUP but both quarterbacks continually missed the All-American on fade routes. They connected with him just 4 times and were intercepted twice as well. Zylstra was able to use his athletic ability, taking a 10 yard sideline pass and turning it into a 52 yard score. Nate Gunn (#23) has been the Mavericks bell-cow back for the second straight season. Gunn’s amassed over 1,000 yards each campaign, with 20 scores in 2018. He is averaging a pedestrian 4.7 yards per carry but his grinding running style fits the MSU offense. Gunn went for 114 yards against the top rushing defense (ypc) in D2 a week ago. Unlike the TSU runners, Gunn seldom has a breakaway carry for a longer score; instead he typically gets 3-5 yards per offering seemingly time after time. 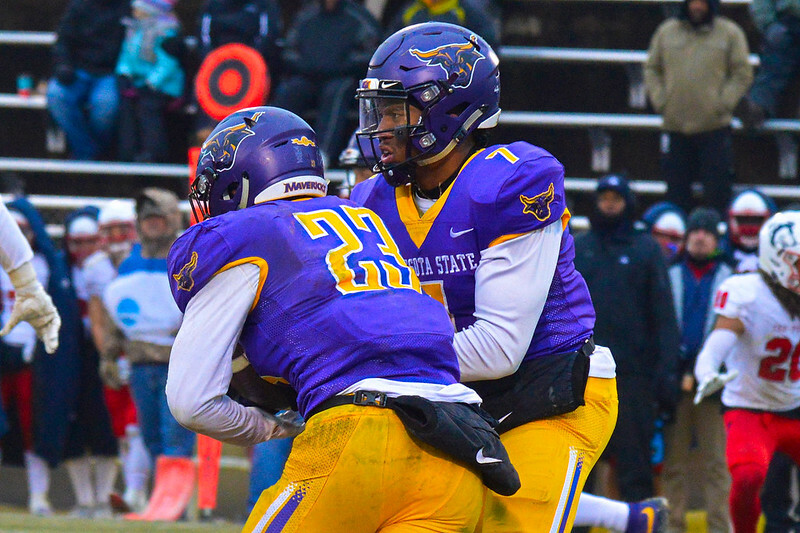 The Mankato defense is front 7 powered, with the team very good against the run (85 yards per game). 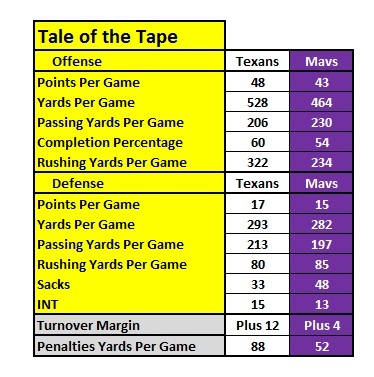 A week ago the Mavs limited one of the better ground attacks in the playoffs, holding CSUP to 91 yards. Like the Texans, the Purple and Gold prefer a 4-man front and have gotten to the quarterback 48 times this season. Similar to TSU, the perceived weakness with MSU is the secondary. The defensive backfield has shown signs of struggling this year but has played better of later. 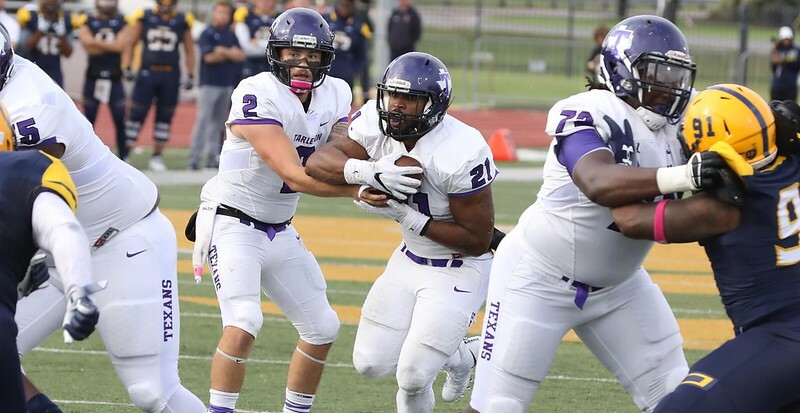 After watching Tarleton against Texas A/M Commerce, along with highlights of all their other games, it’s apparent that the Texans are faster and more athletic than Mankato. They also play with moxie which makes for an interesting clash of styles against meat-n-potatoes MSU. With freezing rain, snow and 20 mph wind expected, it’ll be interesting to see how the Texans adjust to the conditions. This will also be their first game on grass. Typically, I don’t look at playing on grass as much of a factor, but if potential sloppy conditions will impact one team more than the other, I’m guessing it’ll be Tarleton with its speed. Furthermore, TSU QB Ben Holmes hurt his knee a week ago. Holmes gutted it out until the end often aided by his lineman to move up the field (remember Byron Leftwich?). Will Holmes be his normal scrambling self or will he be hampered by the knee as well as a potentially slick surface? When TSU has the ball, expect the Mavs to sellout against the run. When MSU is on offense, it should be the same thing. Both teams are very good at slowing down the ground game and neither team is great in the passing game, simply capable. Tarleton should limit the Mavs running game but I do think they are at risk in the back half against Zylstra and other targets underneath. That said, the Mavs quarterbacks don’t instill a lot of confidence that they’ll be efficient through the air. I was surprised a week ago at how often the Mavs threw, risking turnovers against the top turnover squad in D2. MSU did get picked 3 times but made enough plays in the passing game to offset those shortcomings. Ben Holmes has been a 60% thrower for the Texans this season, but if you dig deeper he’s a 50% passer against the top teams. A week ago Holmes completed 10 of 21 with 1 score, 2 interceptions. Even with those numbers, I favor the Commerce secondary a week ago over the Mavs. The challenge Mankato will have is tackling in-space and not to allow a 5 yard gain become a 60 yard score. If the Mavs struggle to contain the Texans running game, things will likely be one-sided, considering TSU’s explosiveness. The teams are very similar. Offensively, two of the better ground attacks in D2, along with star, gamebreaking wideouts for each squad. Defensively, both are especially good against the run while susceptible to the downfield passing game. There are a few “other factors” that swing in the direction of Mankato: 1) the potential injury risk of starting QB Ben Holmes; 2) the sheer volume of penalties and occasional lack of discipline from TSU; 3) an exceptional kicking game for Mankato; 4) MSU playing at home. If the game gets one sided, I think explosive TSU will have a runaway victory. BUT, I think the “other factors” mentioned above will make just enough of a difference to win the day for the Mavericks. 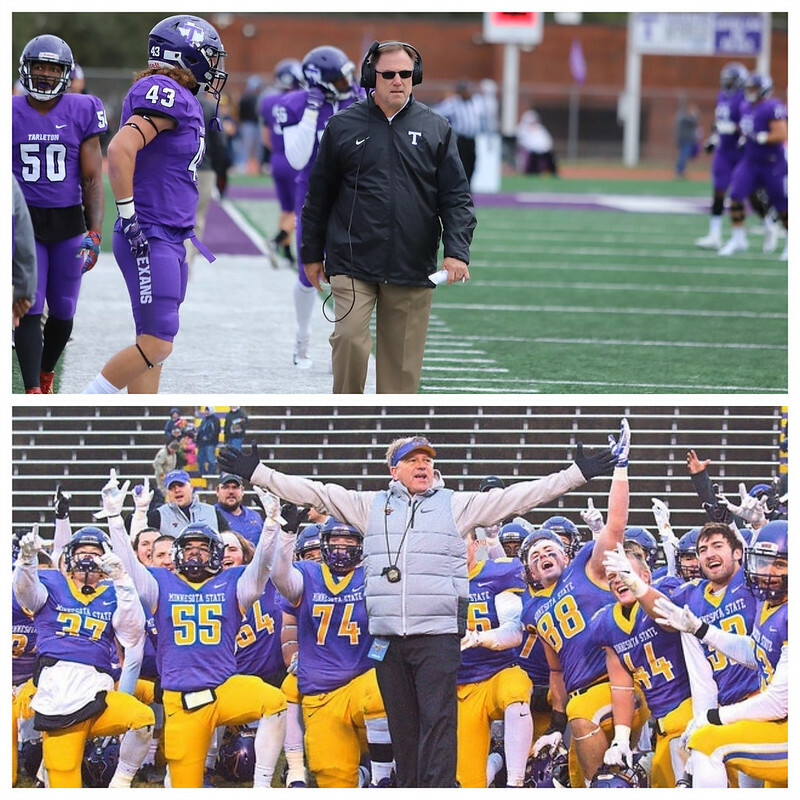 Whoever prevails likely advances to the D2 Championship as this is a matchup of two of the top teams in the country.